Fix brackets to ceiling or lintel with holes drilled on a line at least 75mm from the wall or window frame for blinds with 127mm louvres or 55mm for blinds with 89mm louvres. End brackets should be about 40mm from the ends of the track. Any remaining brackets should be spaced evenly between these two brackets. Fix brackets to wall or window frame as closely as possible to the ceiling or lintel with same spacing as recommended for the top fixing brackets. If your blind has a pelmet please refer to the pelmet fitting instructions before proceeding. The track must be fitted into the brackets keeping controls to side ordered. Locate the small lip projecting from brackets into groove in track. Push track up into brackets. 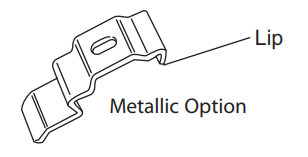 Spring clip brackets will hold your track without further adjustment. 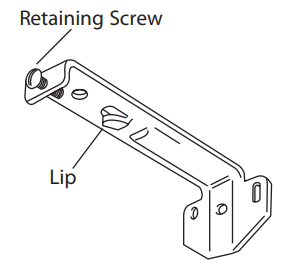 If your brackets have retaining screws, these should now be screwed into the other slot in the track. Please do not over tighten the screws. This is unnecessary and will damage the track. Turn hooks so that the slots are 90º to the track. Hang the louvres, keeping all seams one way. 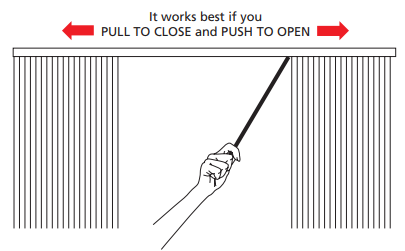 Do not traverse blinds with louvres in closed position. Always turn them 90º to the track before operating cord control. To rotate Louvers, rotate the wand in the direction you want the louvres rotated. To open or close the louvres, first rotate the louvres open. Then push or pull the wand to open (stack louvres) or close (unstack louvres) the blind. louvres when the blind is rotated closed.